Update: photos have been posted to our Facebook Page here. 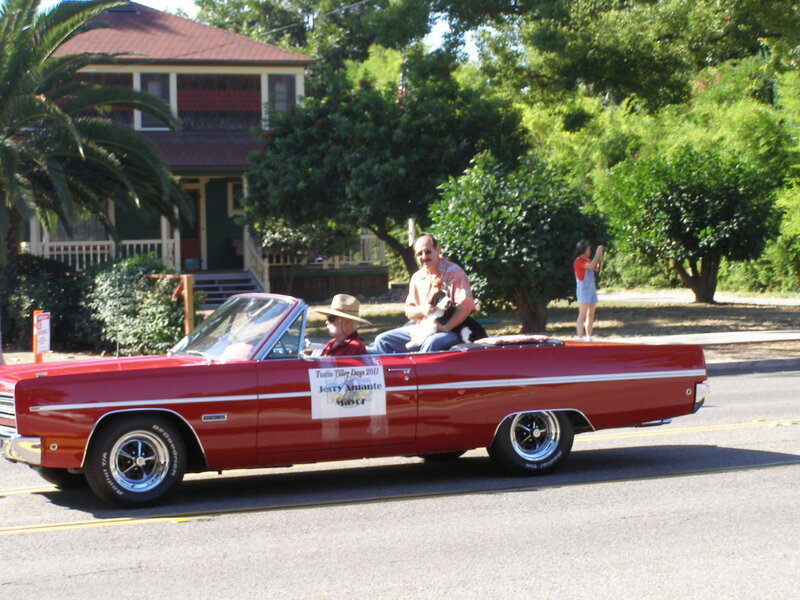 Today’s 54th running of the Tustin Tiller Days Parade was the best ever. Over 125 bands, floats and organizations, sprinkled liberally with politicians, horses, and Shriners strutted their stuff down Main Street, USA. There were more folks from the surrounding area lining our streets and enjoying the great band music and drill teams. My family and I look forward to this little piece of Americana each year. I was busy manning the camera and tweeting the latest parade entrants from the comfort of my own porch where my better half had laded in chocolate croissants, fresh fruit and Trader Joe’s Bay Blend coffee. It doesn’t get any better than this. Our new neighbors were awestruck by how great this kind of event makes our town feel. Even Mayor Jerry Amante brought his dog to the parade. Nice dog, Jerry. Too bad you can’t be as mellow as him. If you missed it, you will have to wait, sorry. But, you can come join us for coffee and croissants next year. I’m thinking, maybe, block party? Posted on October 1, 2011, in Local Government. Bookmark the permalink. Comments Off on Tustin Tiller Days Parade – What a Day.